Melville, NY—Canon Solutions America, a wholly owned subsidiary of Canon USA, Inc., and DirectSmile GmbH, a leading supplier of software solutions for cross media marketing automation, launched a suite of cloud-based tools for building, managing, and tracking data-driven personalized marketing campaigns across print, web and mobile media. 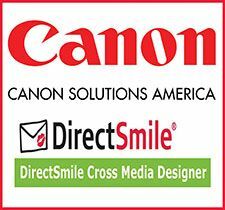 The DirectSmile Cross Media suite is a scalable solution that’s designed to bridge the gap between print and Internet for print services providers of all types—from in-plant corporate reprographic departments to commercial printers. The all-in-one solution for personalized communications is comprised of three cloud-based offerings: Print &Web, Cross Media Marketing, and Inbound Marketing.